Lulu's Garden: Hip Hip Puree! I am a lucky girl and get to go to a very lovely nursery called Lecropt for three days every week while Mummy & Daddy wave the Vialii flag! (1) The nursery have come up with a great idea to create a recipe booklet with favourite recipes of the kids who go there that can be shared with all the other Mummies and Daddies. I have lots of favourites but I wanted to share some with a home grown slant to them so that other children can be inspired to grow some fruit and vegetables like I do! make sure they are good for pureeing! I had already shared my strawberry yoghurt recipe with the nursery which is a cheap, easy and healthy snack for lunch bags. 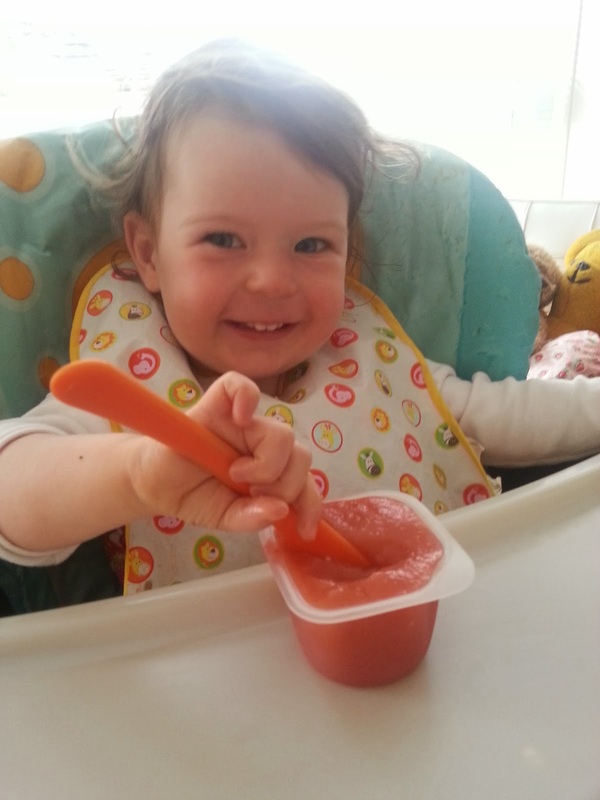 Another "pudding" recipe idea which avoids refined sugars and uses some lovely home-grown produce is the simple and ever-loved fruit puree. windfall apples off our tree! In our garden we are lucky enough to have several apple trees and a plum tree. 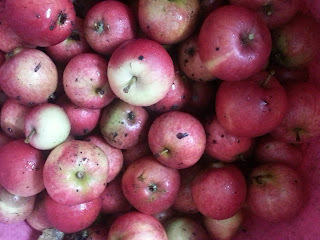 Right now they are laden with fruit which I love to pick and munch straight off the trees! This recipe is a great way of using up apples which have some imperfections or have been blown off the tree in the wind. You can simply cut off any horrible bits and use the rest. For the apples, peel, core and cut them into slices. Pop them into a pan and cook gently for about 5 mins or until soft then blend them to whatever consistency you prefer. 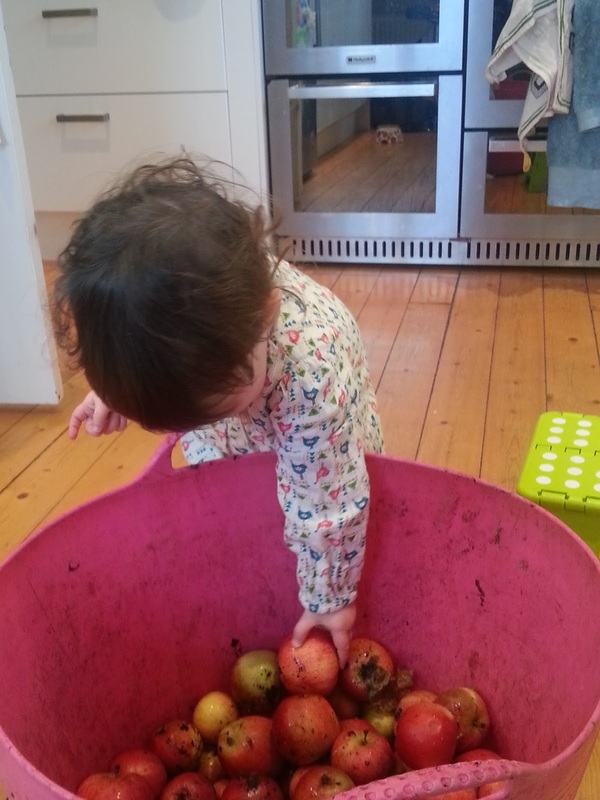 For the plums, halve them and remove the stone. Place them face down on a baking tray with a little water and pop them in an oven for about half an hour until the skins are all wrinkled. The skins will now be really easy to remove and you will be left with the soft flesh. You may need to sieve some of the juice off so your puree isn't too runny. Then blend. look a bit like traffic lights! 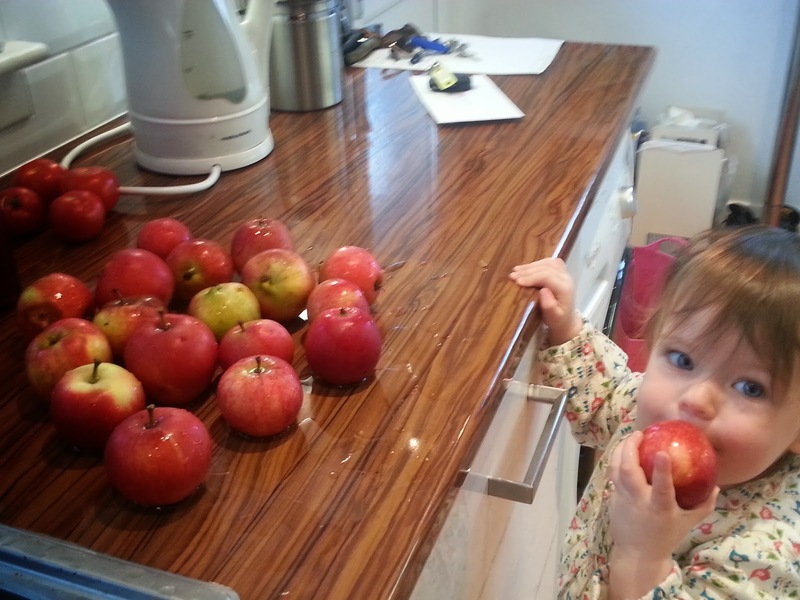 It's nice to have different flavours so we left some just apple, some just plum and some are a mix of the two. 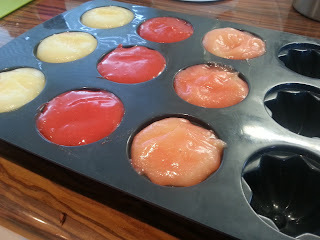 You can add cinnamon, vanilla or whatever other flavours you like while you are cooking the fruit. And if you grow other lovely fruit in your garden then you can do the same things with them too! you buy in the shops and much cheaper! The purees can be stored in the fridge for a few days or can be popped in the freezer so they can last for ages. Mummy puts ours into a silicone tray and then once they are frozen they are popped out and put into freezer bags. These trays are brilliant and a great way of storing all sorts of leftovers such as cottage pie, curry, bolognese, fish pie etc. 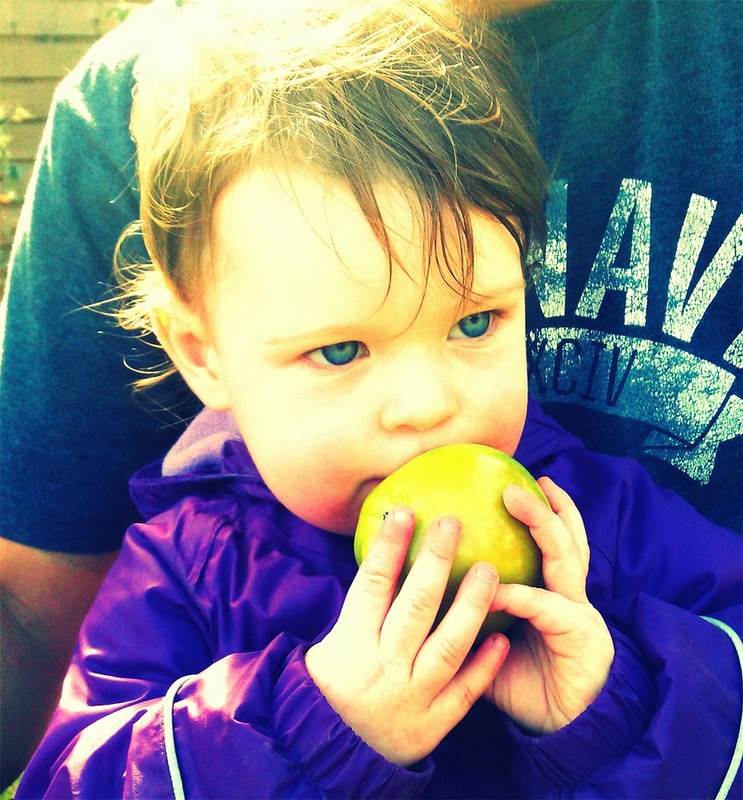 so that you have handy sized lunches you can take to nursery for a lovely lunchtime treat! Old yoghurt and custard pots make equally good containers for freezing the purees. It's a simple recipe but a great way of using up some excess fruit from the garden and a super healthy dessert! 1. Sometimes M&D go to a nursery too but there are plants not children at that nursery. I hope the plants have as much fun there as we do at our nursery. 2. I always find it best to keep an eye on them though, you can never trust them alone! Jamie and the Giant Sunflower!